James Van Der Beek and wife welcome a baby boy! Aw, good news! There is another Van Der Beek man in the world now. James Van Der Beek and wife Kimberly Brook had their first son together. OK, so we heart babies and we heart Dawson’s Creek. So, when James Van Der Beek has a baby — double the love, ya’ll! True story: James Van Der Beek and his wife Kimberly welcomed their first son yesterday. The couple married in 2010, and already have a 17-month-old daughter, Olivia. Now, it’s time to break out that diaper dispenser and quit that whole sleeping shindig again. “Had my first son this morning… well, actually, my wife had him. I just caught him. Wow. Heart expanding way faster than my brain,” Van Der Beek tweeted. That just topples our cuteness scales, right there. Soon enough, there will be a little James Van Der Beek Jr. running around… It just turns our hollow hearts into a goopy mess. Well, there ye go, kids! Try saying, “James Van Der Beek likes Dawson’s Creek” three times fast. Godspeed! 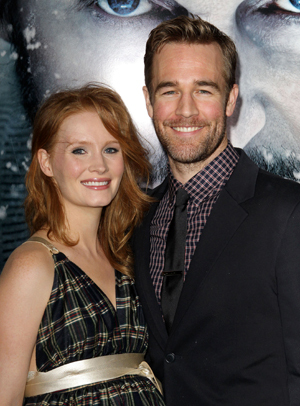 James Van Der Beek is going to be a father again!